My Library "has changed my life." Why buy when you can borrow? Get your Library Card today! My Library seeks to raise awareness about APL's free community resources. This homegrown grassroots awareness campaign features quotes and photos from Library customers and staff. Get involved! 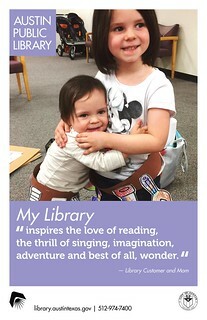 Share your Library story using #AustinPublicLibrary.